New students heard from deans and current graduate student. 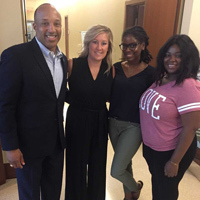 On Aug. 18, Webster University welcomed over 150 new graduate students at the Graduate New Student Orientation in St. Louis. The morning was opened by Beth Russell, assistant provost for graduate studies, followed by welcome remarks by Vice Provost Nancy Hellerud and President Elizabeth (Beth) J. Stroble. 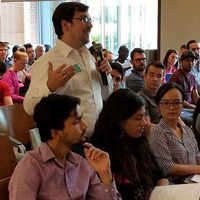 The students then heard from a panel of current graduate students, followed by a "Meet the Deans" session and various concurrent sessions ranging from writing skills for graduate school to career development. Graduate New Student Orientation is hosted in St. Louis twice a year, prior to the Fall I and Spring I terms. The orientation is designed to provide students with critical and timely information for a successful start in graduate school.